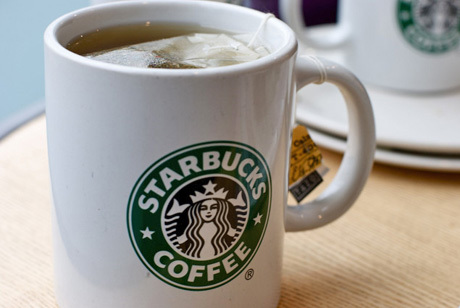 Starbucks plans to open its first stand-alone tea shop this fall. The store, which will operate under the company’s Tazo brand, is scheduled to open at a Seattle shopping center across town from Starbucks’ headquarters. The tea shop will include a staff-run blending bar where customers can mix their own tea from more than 80 loose-leaf choices. Offerings will also include iced teas, tea lattes and full-leaf tea sachets. Besides tea, the store will feature packaged chocolates, infused sugars and honey, varying types of tea snacks, as well as brewing merchandise. 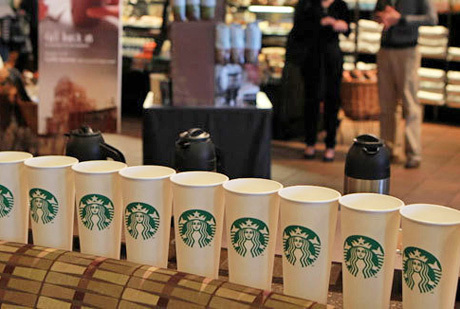 Starbucks bought Tazo in 1999 for $8.1 million, and according to Starbucks’ executives, Tazo already represents a $1-billion business for the company. Lisa Jennings with Restaurant News points out that Starbucks has been selling Tazo Tea in its coffeehouses and grocery stores for years, but the new concept will be the tea brand’s first outlet. Tiffany Hsu with the Los Angeles Times notes the global tea market is estimated to be worth $95 billion. “It’s becoming increasingly difficult to refer to Starbucks as a chain that serves mainly ‘Joe’,” writes Hsu. “The company recently launched its Evolution Fresh juice store in Washington state. This month, it paid $100 million to buy Bay Area bakery brand La Boulange. According to the NPD Group, a market research firm, tea is among the top five fastest growing beverages on restaurant menus, and coincides with what research says consumers are looking for: a health oriented beverage that’s low in calories, soothing and refreshing with exotic blends and flavorings. Starbucks will be competing with Teavana Inc., an Atlanta-based chain of upscale tea shops offering loose-leaf teas and accessories. Teavana also offers tea in retail outlets in 223 US and Canadian locations and 18 franchised locations in Mexico. Jennings claims other competitors will be Argo Tea, Talbott Teas, and Stash Tea Co. Argo Tea is a tea shop/café concept that is also growing its grocery store and foodservice presence. Jennings also notes Jamba Juice acquired Talbott Tea with plans to grow tea options in its smoothie shops as well as a packaged product in grocery and other retail outlets. And tea wholesaler Stash Tea is planning to open a tea bar location in Portland later this year. Sharon Zackfia, an analyst with William Blair & Co., predicted that Starbucks will assimilate knowledge from the Tazo test location to enhance its tea-beverage platform within its coffeehouse units. 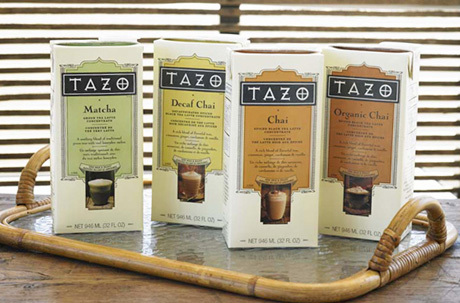 “It also remains a question as to how effective Tazo’s selling and educational techniques will be for a U.S. customer base that remains largely untutored in the art of tea, whereas Teavana’s intensive training processes are well proven, given incredibly high sales productivity of nearly $1,000 per square foot,” Zackfia wrote. Starbucks also plans the sale of single-cup coffee machine this fall, allowing consumers to brew lattes and other drinks at home. The company also offers other single-cup options, including K-cups that are compatible with the Keurig systems made by Green Mountain Coffee Roasters. Love the Idea of This. Someone Needs to Kickstarter this and take my money. So I have moved away from the personal use of antonioevans.com. I was using it as an aggregator for various blogs I track (techcrunch, hackernews, mashables, nytimes). It was a great tool to see what “buzz” was going around in the industry but I think a better use of this blog is to push out my view on what is going on in the various industries I care about. That being food, startups, and tech in general. How to move a lifestyles business into a Tech Powerhouse? How big is our bubble and how does it relate to me? Small Businesses and the web are a match made in heaven. These are a few posts I am thinking about. Love your feedback. Love founders stories and Daniel Raffel, who is crushing it wiith Snapguide knew that creating the perfect launch team was critical to his business. He worked for a while under chef Thomas Keller of Per Se + French Laundry fame. Check out what he learned from a 3 Star Michelin Chef and how he brought his training to the Startup world. We need more Cow bell! The global economy is in a pretty precarious state and quite recently, in a BBC debate organized as part of the IMF-World Bank Annual Meetings, IMF’s managing director Christine Lagarde warns that the world economy has entered a dangerous phase. World leaders are feeling the money crunch and leaders of industry are admitting that their prospects are a little less than bright. In the BBC debate, the two most prominent problems include the crisis of confidence in the Euro area and the economic problems in the United States. These are the places that developing countries look to for aid and support, but in their current states they seem to be the ones in need of support. With the deficit currently dividing America along the right and left of the political line, politicians need to get more creative about where they get their revenue so that the status quo (well, that prior to the economic crisis) can be maintained. Countries need to look for new ways to generate revenue to fill their coffers again. As suggested in the BBC debates, America needs to be less reliant on excessive consumer spending and bank more on exports and manufacturing. But these are measures that will take time and effort, and in the current state, it is imperative to look to other avenues for generating profit right now. There is untapped wealth in the virtual world of games and the sooner the government realizes this, the sooner we will all be able to climb out of the debt hole. As of this writing there has been no move yet to tax in-game economies, but the idea of taxing them isn’t new. MMOs are communities within themselves, and where there are established communities there are transactions; where there are transactions, there are taxes. And in this case, there should be. All over the world there are billions of people going online and playing into the system. Billions. Exchanging real money for virtual money may seem like a strange concept to non-gamers and even to some gamers. Why pay real dollars for digital coins? Think of it this way: when you go to a foreign country, you have to exchange your money for the local currency to be able to transact with the locals, right? This also applies to the virtual world, you exchange your currency (real-world money) to be able to transact in the synthetic world. Your real world money now forms part of the in-game economy. So now that your real-world money has found itself inside the game you’re playing, what’s next? How can it possibly contribute to pulling the country out of debt? Well, before we discuss your active participation into taxation, let’s first talk about the people who are getting around to having to pay for their fair share. Whether you’re playing World of Warcraft, Runescape, EverQuest or any other game, levelling up is important to being able to play the game better. In some cases you’ll need to level up in order to have access to certain things or to be able to beat stronger characters. This takes time and effort and some gamers just don’t have the patience to grind. So what these gamers do is to have someone else do the grind work for them. There are sites that offer to do the grind work for gamers: and it’s not just leveling up, it’s also for gaining gold and getting better stuff in general. In order to put a stop to this unfair practice and save those people in third-world countries from the tyranny of gaming for others, games should cooperate with the government and set up a system where everything goes through the proper protocol. Need to mine? Get a permit to mine and set an environmental limit that would make it fair to all other users. If these third party sites want to stay in business, they need to be legitimate and being legitimate means that the players are protected as well. Games should put a system in place where transactions with third-parties are ported and have the government look in on these transactions just to make sure that everybody keeps their hands clean. Teaming up with the government is a nationalistic duty and choosing not to aid during a fiscal catastrophe is really tantamount to treason. With all the illegal and unfair stuff out of the way, we can now discuss the business of addressing key issues in the taxation of in-game economies. For every game, it should be a requirement to have a Chief Economist to keep the in-game economy well-balanced and productive. The Chief Economist will have a lot to contend with as a revised set of taxation laws will apply covering every transaction that takes place within the game. First off, taxes should be proportional. Ordinary weapons and items will be taxed lower than special items depending on how they will be valued under the tax laws. The shiny gold armor and the personalized chain mail will be considered luxury items and therefore will have higher taxes on them. And ordinary gamers need not have to worry because the virtual world is the best place for taxing the rich or at least those who are big spenders. If you spend within your means, you’re fine: it’s those players with the flashy stuff and the too big swords that are going to have to pay through the nose. What’s great about the new laws is that it will not discriminate against minors: if they own an account then they will be charged and treated just like any adult. There is nothing quite like getting hit with taxes that teach a young boy or girl what it means to be an adult. And as the owner of the account, they will have the juridical personality to be able to answer for any charges brought against them, which is truly pushing the phrase “you’re playing with the big boys now.” Yes, kid, you sure are! In no time at all, the real world will be able to recover from economic crisis with the creative collective power of gaming. Huzzah! **Note** This is a piece of humor. Growing up in Queens, I saw a lot of kids drop out of the local high school. They got tired of going to school and decided that they were better off getting a head start on getting jobs and getting paid to work. I’d see them on the nearby basketball court or at the arcade and asked them what turned them off school, they’d usually say “I’d rather have the money.” I always felt it was something more than that. Admittedly, school was pretty boring but many of us still managed to get through the experience so we could get a diploma. Dropping out may have been OK for people like Steve Jobs and Mark Zuckerberg, but for most kids, including the ones I knew, they’re more likely to end up doing menial jobs for minimal wage or dabbling in shady business. Had school work been more interesting and engaging, more of us would have finished and gotten better opportunities in life. One of the most important things to take into consideration in teaching is gauging the students’ level of interest and engagement in the subject matter. The school district can sink all the money they can into putting up computer labs and creating interactive learning spaces; but if the students do not engage they have only managed to succeed in creating an arcade for uninterested players. Fortunately, research shows that students are better engaged and show more interest when given tasks to do in an online social environment. Educators can use the appeal of new media to their advantage. Gaming and social networking keep students actively engaged, making them more eager to learn and more open to learning. If they had made a game out of subjects like geometry and algebra where we could have seen and appreciated the practical applications, maybe we would have taken it more seriously. And if our high scores could have been shared on Facebook, that would have given us a sense of pride and accomplishment not entirely different from having our names called for an award. And maybe we would have even shared this game with our classmates who had dropped out; they probably would have learned something they could have used even if they were never going to back to school again. When students are young, learning is encouraged through fun physical activities; children sing songs that help them remember the alphabet, numbers, colors, shapes, and sizes. Reward systems are set up in the form of gold stars and extra credit points. Sports are encouraged to promote teamwork and socialization. All of these mechanisms are present in online games but why then do most people consider gaming and education as fundamentally separate? Different people learn differently and not everyone responds to traditional teaching methods. Acknowledging that there are other ways to teach and engaging the differently inclined would mean that all students not only learn what they have to but also that they learn because they want to. To encourage participation, it is important that students actually get to see that this new thing is happening. Don’t be restrictive by just doing it with a selected group; make it public and show everyone that learning can be fun and competitive at the same time. In a competition, somebody has to win. But this doesn’t mean that the losers have to go home with nothing; if you don’t win right now, you’ll always have another chance. Winning something gives affirmation to the idea that one is capable of achievement, and this affirmation can be its own reward. The idea of incentivizing education has been around for a long time and is still a hot debate topic. I think that offering an incentive works; who doesn’t like to be rewarded for a good effort, right? The teachers and students may already be into the idea of alternative learning modes and radical ideas regarding education, but if the parents are not involved the success of any school program is compromised. If parents can be sold on how effective the new curriculum is and how it would ultimately benefit their child, they will show their support and it will make it easier for everyone. Applying the game mentality to learning projects and real life can take the boredom out of daily activities and make work fun and challenging. Whether one responds better to the achievement of personal challenges or is more likely to perform in a competitive setting, setting up “gaming” environments in reality can bring a positive shift in one’s mindset, increase productivity, and ultimately bring more satisfaction. We used to do this spelling game in school where the class was divided into two groups and players had to spell a word on the blackboard; whoever spelled it first got points (provided that they spelled it right) and at the end of the game the team that got the most points won. We didn’t really win anything but we were happy to play the game and unconsciously we were learning to work and think faster without being forced to study. The game replaced the notion that words were inanimate and boring; in the game, the words were important and because they were keys to winning we had to get the words right. It may seem like a stretch to consider games as a microcosm of life, what with death in gaming being merely temporary and looking absolutely ridiculous eliciting no response from in-game characters, but there are parallels to be drawn. To be clear, no sane person can mistake a game for reality; a gamer may prefer the gaming environment to the real world, but normal gamers are able to distinguish between games and reality. The proponents of the belief that playing violent video games make a person (a child in particular) violent give too little credit to human cognitive experience (something was already wrong there, even prior to the violent video games) and place too much blame on a technological tool. And yes, it is a tool; something that we can choose to teach important skills and valuable lessons. In the game, we are given a set of skills that we can level up by performing certain tasks a certain number of times; in real life, this same practice and repetition is required to learn to do something like play the violin or cook perfect scrambled eggs. In games, we learn to be patient even as we spend hours on end getting our character to level up or in attempting again and again to get past that one jump right next to the save point. We focus entirely on the task at hand (getting to a certain level, beating the level boss, finishing a quest) and lose all sense of time. Imagine if we all felt that way about working? But one of the most important game skills that translate into valuable real-life skills is the ability to work against a given environment, which teaches us resilience, perseverance and adaptability; we don’t choose the world we play in, but we can choose the manner in which we play in them. Personally, I think that games provide an outlet for survival instincts that we have lost in adapting to modern living. Before supermarkets and grocery stores, people used to be more connected to how the food is procured. As hunter-gatherers, we used to trap, catch and kill our own food and plant, grow and harvest our own crops. But as modern citizens, our food is easily available, clean and fresh, individually wrapped, most of the time ready to eat. My theory is that there is still that part of us that craves that experience of being a hunter-gatherer, which is why we react positively to games that would simulate that experience. Why else are farming games so popular and running after monsters in RPGs so enjoyable? Games help to re-establish the instincts we thought we’d lost in our decidedly too suburban lives. Perhaps in the future, gaming will be incorporated into all facets of life and nobody would think of it as a mere microcosm of life. Perhaps it will be so essentially intertwined with the processes of daily life that gaming becomes real life. I can imagine plenty of cosplayers will be very happy with that. The competition of Man vs Machine is on and Jeopardy is the stage. Watch Ken Jennings and Brad Rutter try to beat Watson a computer comprised of ninety Power 750 servers, and 16 TB of memory and 4 TB of disk storage. The Blog of Antonio Evans. I am a traveler, entrepreneur and food lover. Founder and CEO of FriendsEAT. ...unless you hate personal growth! Copyright 2015. Antonio Evans. All Rights Reserved.